RALEIGH – The Civil War savaged lives yet secured the future of generations in North Carolina and the rest of the nation, and altered the course of American history. The injustices suffered by African Americans were a major cause of the American Civil War (1861-1865). The fight for liberation is one aspect seen in the “Freedom, Sacrifice, Memory: Civil War Sesquicentennial Photography Exhibit” (www.nccivilwar150.com), which will visit the Pender County Public Library in Burgaw and the Rockingham County Public Library in Eden from Sept. 1-28. The exhibit will commemorate the bravery and resiliency of North Carolinians throughout the Civil War with stimulating images gathered from the State Archives (www.archives.ncdcr.gov), the N.C. Museum of History (www.ncmuseumofhistory.org), and State Historic Sites (www.nchistoricsites.org). A total of 24 images will be displayed by the N.C. Department of Cultural Resources (www.ncculture.com) in 50 libraries throughout the state from April 2011 through May 2013. A notebook will accompany the exhibit with further info rmation and also seeking viewer comments. The collection depicts African Americans, women and militiamen, including images of artifacts and official documents. One picture depicts an African American Union soldier in the U.S. Colored Troops (U.S.C.T.) from a Civil War re-enactment program. More than 5,000 North Carolina blacks are documented as having served in the U.S.C.T. for the Union Army and Navy. Despite resentment from Confederates, African Americans dutifully served, paving their way to freedom. 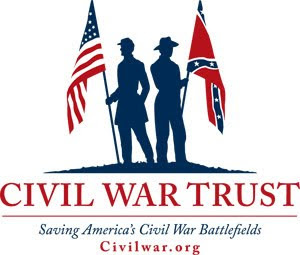 The statewide tour will visit various regions presenting the importance of North Carolinians in the Civil War and educating viewers about each area’s participation and commitment during this tumultuous time. For info rmation on the Pender exhibit call the library (910) 259-6558. For info rmation on the Rockingham exhibit call the library at (336) 627-1106. For info rmation on the statewide tour contact the Department of Cultural Resources at (919) 807-7389 or go to www.nccivilwar150.com. If you have the read this blog for any length of time, you probably already know a great deal about Avery County and the war. For the past ten years, I have called Avery County home, and I spend a great deal of time, working with school and scout groups, and the community, both learning about and and teaching others about what went on in the area during the war. Avery County is celebrating its 100th anniversary of formation this weekend (the actual date was in February, but unless you want to ski down the street, we don't expect many folks at a parade in Avery County in February). There will be a parade, concerts, festivals, and I'm even participating in a local living history on the square in front of the courthouse. So, I thought we could make Avery County the focus of our next North Carolina in the Civil War county profile. Since we are celebrating the 100th anniversary of our founding, you've probably figured out that Avery County did not exist during the War. The area was a part of Watauga, Mitchell, and Caldwell Counties, with the majority lying in Mitchell. Avery County was sparsely settled in the 1860s, with most of the inhabitants living in the southern, less mountainous region, which in itself is a contradiction, considering that the whole area is pretty mountainous. Most men in the area served in Company A, 58th North Carolina Troops, also known as the Mitchell Rangers. This company was organized in December 1861, a reaction to the bridge burnings in east Tennessee. The Mitchell Rangers were a part-time infantry and cavalry organization. 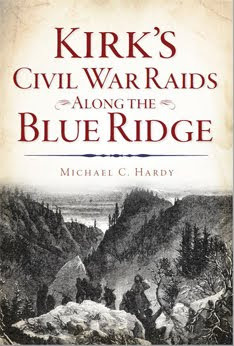 They spent their time guarding mountain passes from the Unionists in east Tennessee. After the conscription ordinance was passed, the infantry of the Mitchell Rangers became Company A, 58th North Carolina Troops, while many of the mounted men transferred to the 5th Battalion, North Carolina Cavalry, and even later, the 6th North Carolina Cavalry. There were a few others who served in the 6th North Carolina State Troops and the 29th North Carolina Troops. There were also some men who served in the 3rd North Carolina Mounted Infantry, a Federal organization made up of men from the mountains of western North Carolina and east Tennessee. Within the confines of Avery County there was the Cranberry Iron Mines, which produced iron ore for the Confederacy, employing up to 40 men during the conflict. In June 1864, Capt. George W. Kirk of the 2nd/3rd North Carolina Mounted Infantry led a raid through the area and into Burke County. The Federals' goal was Camp Vance, which they successfully destroyed. They fought several skirmishes with local home guard contingents on their way back up the mountain. Kirk's Raiders were armed with seven-shot Spencer rifles, so the contest always tipped in favor of Kirk's men. Once back into present-day Avery County, the Raiders burned the home of Col. John B. Palmer and destroyed the iron works at Cranberry. One other important part of local history can be found in the Banner Elk community. There was an underground railroad that ran through Watauga County, with Banner Elk as one of the stops. This underground railroad funneled escaped prisoners from Salisbury and from South Carolina, along with other dissidents, through the mountains and into Federal-held territory in east Tennessee. The Banner Elk community was a Unionist haven, while at the same time, ironically enough, the Banners were the largest slave owners in the area. There were no veteran groups in Avery County, nor is there a Confederate monument. 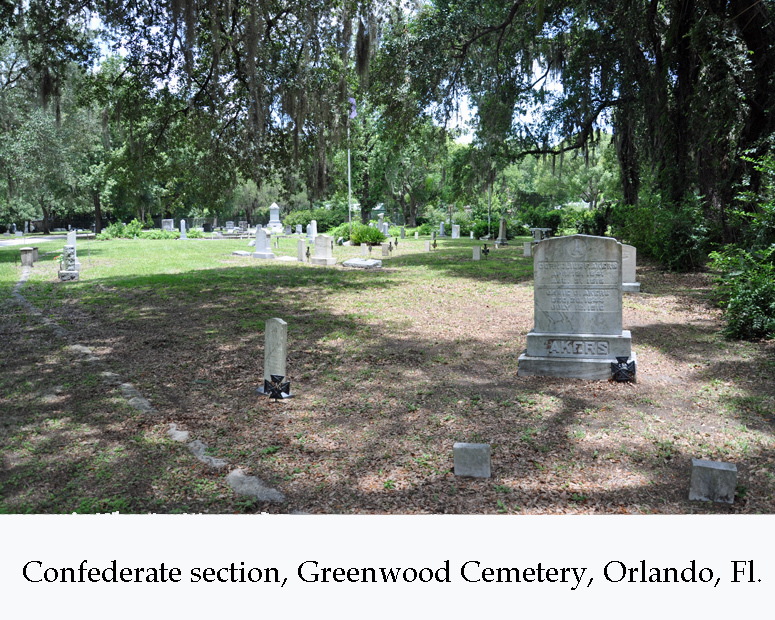 The only monuments can be found in the numerous cemeteries scattered throughout the county. Ready for the official announcement? 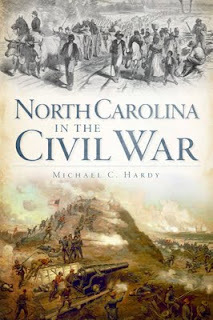 I am now taking pre-orders for signed copies of the soon-to-be released North Carolina in the Civil War. Signed copies are $20, shipping included. You can order by visiting www.michaelchardy.com and following the link on the bottom of the page. Or, you can send a check to: PO Box 393, Crossnore, NC 28616. Get your order in early! 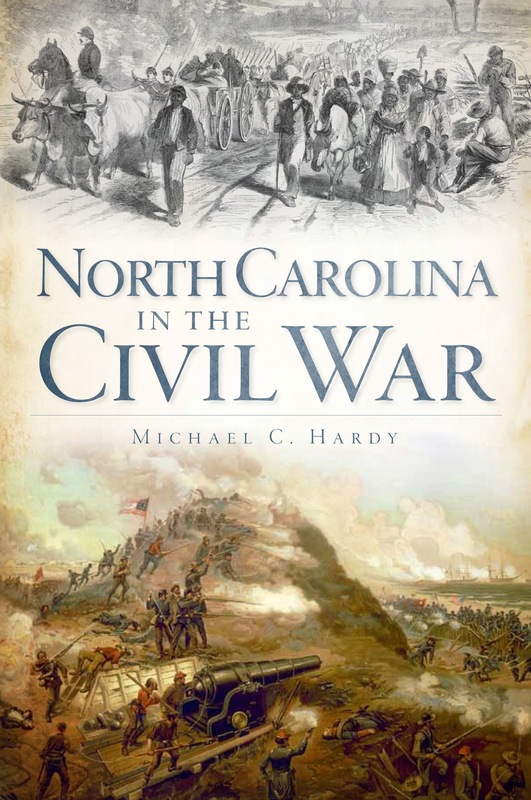 It is the first concise, well-illustrated history of North Carolina in the Civil War in over thirty years. 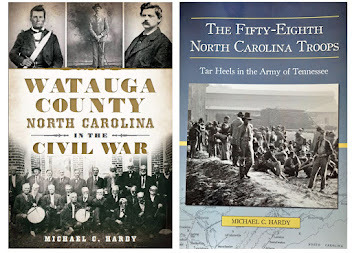 The first half of this brand-new book is devoted to what happened within the Tar Heel state in the tumultuous years between 1861 and 1865. 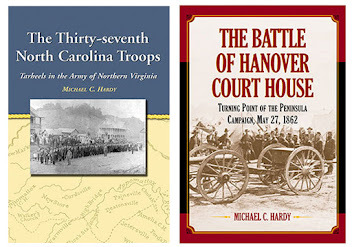 North Carolina in the Civil War looks at the military campaigns within the state, from the capture of Fort Hatteras in 1861 to Stoneman's Raid in March and April 1865. The political realm is covered, along with the socio-economic conditions of the state during those years. But North Carolina in the Civil War goes even further. 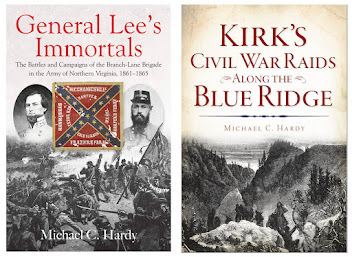 There is a chapter that examines Tar Heel regiments in the battles fought by the Army of Northern Virginia and the Army of Tennessee, including Big Bethel Church in June 1861, Gettysburg in July 1863, Chickamauga in September 1863, and Appomattox in April 1865. There is also a chapter that covers the Reconstruction time period, analyzing the politics and subsequent violence of the era. Following that is a chapter on the remembrance process, from the reburial of the war dead, to the process of building monuments and holding reunions. Lastly there is a brief look at important Civil War-related sites in North Carolina. Though accessible for those just starting to learn about the state's role in our nation's great conflict, the book will also prove valuable to readers at every level of interest. 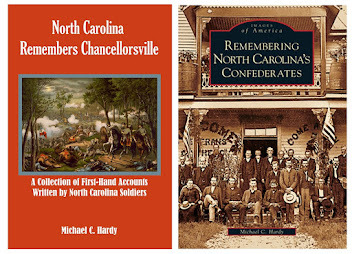 Even those with a strong background in North Carolina's history will find this fresh volume useful and engaging. "Leaving Richmond we went by railroad to Strawberry, and stayed there one night. Next morning we started for Winchester, 18 miles, on foot. We had to make a forced march of it, as Johnston was expected to he attacked by an overwhelming force. We arrived late in the evening, and were drawn out in line of battle. That night I lay in the corner of a fence with some wheat straw for a shelter. We stayed there till late next evening, when, not being attacked, we pitched our tents and slept in them one night. News then came that Gen. Beauregard was attacked by a force of three to one, and that the forces threatening us had gone to unite with those against Beauregard. Early in the morning we struck our tents, and, with thousands of others, left Winchester late in the day. 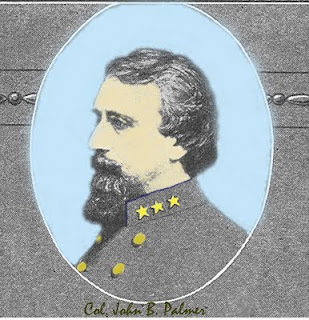 When out of town Col. Fisher read an order from the General to make a forced marched across the Blue Ridge. We marched till late in the night, and then all lay down by the road-side and slept. At day-break we started again, arrived at Piedmont that night and lay out in a wheat field all night. Next morning we were roused before day, and started for the cars, but did not get off till night. I stood it as well if not better than the most of them. We reached Manassas early in the morning, and could hear the cannon firing. We got to the battle field about 12 o'clock, and were led into the fight, and that the hottest of it. Our front rank men fought bravely. We took two pieces of artillery that belonged to the brag battery of the U. S., Sherman's battery. We were standing around the pieces, when some one cried out that we had fired into our friends. The enemy fired upon us from the bushes, and we fell back, as we thought it was our friends. Then they fired on is worse than ever. Our men killed all their horses and they could not take off the guns; so we got them. 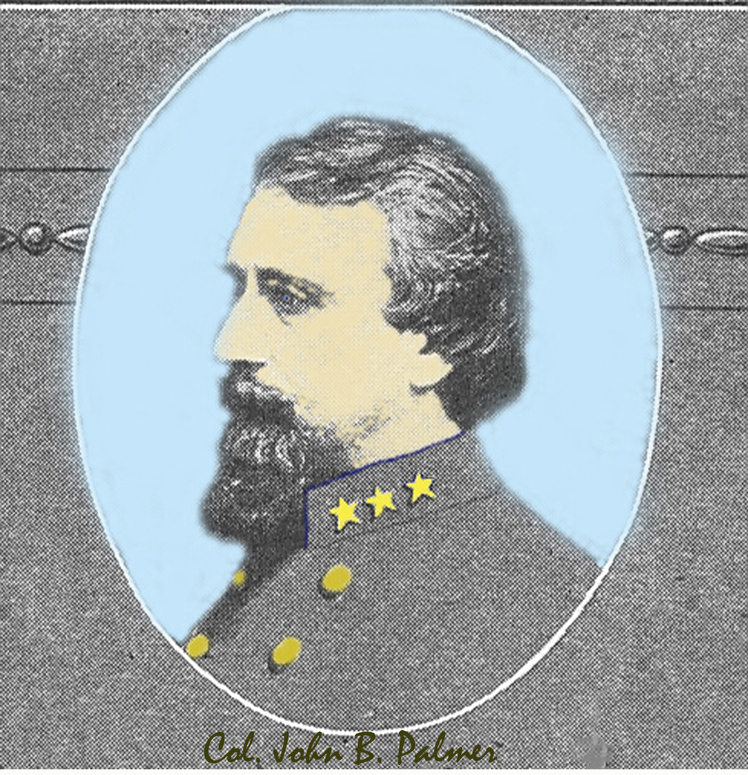 Col. Fisher was killed near the battery. I did not see him fall and did not know he was killed till the next day. He was shot through the head. I never thought I could stand the fire of bullets as I did that day; and how I escaped being killed I do not know. it was just an act of providence that we were not killed by hundreds. About 100 of our regiment were killed and wounded--17 killed and some mortally wounded. After that fight about 145 of our men went with some other regiments to protect the Washington Artillery of New Orleans. We reached a high hill and could see the enemy drawn out in line of battle. We followed them two or three miles, and that is the last we have seen of them. We were then about 8 miles from the Junction. The General told us he would attach is to a Mississippi regiment, and we could stay there for the night. I made my supper that night on berries that I picked about in the old fields. We laid that night on the ground in an old field. On Monday morning it began to rain. Our men said they knew where there were plenty of yankee blankets, over-coats and oil-cloths. Some were sent for them and came in loaded down with blankets, over-coats, india rubber tablecovers, oil cloths, and haversacks. I have a splendid yankee over-coat and so has Capt. Avery. I have also one of their india rubber table-covers. I found these useful, as we had to march 8 miles in the raid and mud. We took thousands of blankets, over-coats, &c.
We have fought the flower of the Northern army, and I think they had a great many more men that we had. Some of the wounded told us that they were old U. S. regulars, and I think they must have been, for they fought bravely. We have just received orders to leave this place, to go I know not where, but I suppose towards Alexandria. N. W. Ray [of Cumberland county] is very well. He was not hurt. LATEST - This morning's mail brought no Richmond or Petersburg papers-no mail north of Warsaw. Col. Fisher's regiment suffered a great deal. They were engaged in the battle with the New York Zouaves whom it is said only two hundred escaped. Lieut. Col. Lightfoot of Fisher's regiment was wounded by a ball passing through his thigh. the Major (whose name we have not heard.) is missing. Originally, Dortch was Lieut. Col. and Lightfoot Major, but on the resignation of Dortch, Lightfoot was promoted and we have not seen the name of his successor as Major. it is said that 250 of Fisher's Regiment were killed or wounded. 300 of Col. McRae's regiment were in the battle, (we do not know what companies) and are said to have suffered dreadfully - not enough men left alive or unwounded to make a respectable company. Col. McRae was not in command (owing to his lameness of course). lieut. Col. Jones doubtless commanded. Col. Kirkland's regiment arrived just as the enemy gave way, and possibly in time to engage in the pursuit. We learn that there was still another North Carolina regiment in the battle, but which it was not known to our correspondent. It has been reported in Raleigh that Capt. Yorke of Fisher's regiment, was killed, and his wife came to Raleigh yesterday morning to meet his body. Instead of that she met friends bringing Col. Fisher's body, who told her of the safety of her husband and of his narrow escape, as follows: He was knocked down and stunned by the windage of a cannon ball. One of the enemy seeing this, rushed upon him to bayonet him; but he revived in time to seize his pistol and shoot the yankee. He seized the yankee's musket and rallied his men to the charge. Mrs. Yorke was yesterday the happy recipient of a letter from her husband and of the said yakee musket. Capt. Yorke is a small man, quite young, had been a teacher in Wake county, (we think he is a native of Randolph,) and he and every member of his company had been Union men up to Lincoln's Proclamation. We have often heard of him as a glorious fellow. Appearances seem to indicate, we think, that North Carolina did her full share of the work, and suffered her full share of the loss, in the glorious day at Manassas. if so, she does not appear, so far, to have received her full share of the credit. As you probably know, today marks the 150th anniversary of the battle of Manassas. 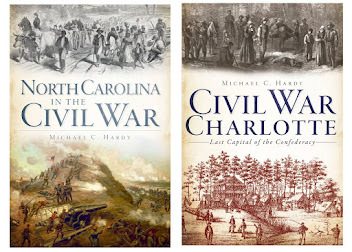 There is much we could discuss regarding North Carolina's role in the battle. Something I hope to post more about later is North Carolina's reaction to the battle. But to start with (possibly to set the tone), I found this piece on the death of Colonel Fisher, killed on July 21 while leading the 6th NCST. This comes from the Raleigh Register, July 26, 1861. The body of the lamented Col. Fisher, of the 6th Regiment of North Carolina State Troops, was escorted yesterday evening by the larger portion of the 4th Regiment State troops from the same State, from the Central depot to the Petersburg depot, en route for home. Col. Fisher was shot through the head and instantly killed, while leading his men in the memorable battle, near Manassas, last Sunday. The grief of his men at the loss of their gallant chief was deep and universal. It has hardly been a week since the lamented officer passed through the streets of our city at the head of his regiment, a splendid brass band discoursing the while the song of an anticipated victory. It came, but the song of triumph was hushed, for victory was bought by the death of many a brave and true man. Coll. Fisher was enlisted heart and soul in the cause of Southern independence. He had used his means unsparingly in the equipment of the splendid regiment that he led so gloriously to battle in defense of our common country. to him victory came even in the arms of death. To his relations and friends it must be consoling to know that a grateful nation will forever keep alive the memory of the heroes who fell on the bloody fields of Manassas. Peace to their [names]. Well, as you have probably figured out, I’ve been gone for the past week. We left the Wilmington area and spent a week in Florida. I always have these grand illusions that I’ll post while I am gone, or that I will write something and post it while I am gone, but I never seem to get it done. Maybe I should just say up front that I’ll be gone…. The weekend in the greater Wilmington area was great. I spent Saturday at Fort Fisher, talking to folks and selling a few books. I even got to watch the firing of their new 32-pounder – a real treat. I spent time on the beach, and just wandering around the site. On Sunday, I spoke to the SCV Camp in Whiteville, and even got a picture of the Columbus County Confederate Monument to add to my collection. I also learned of a previous monument at Fort Fisher, one that is no longer there. Thanks, Fort Fisher staff, for that tidbit, for a super lunch, and for taking such good care of me generally! 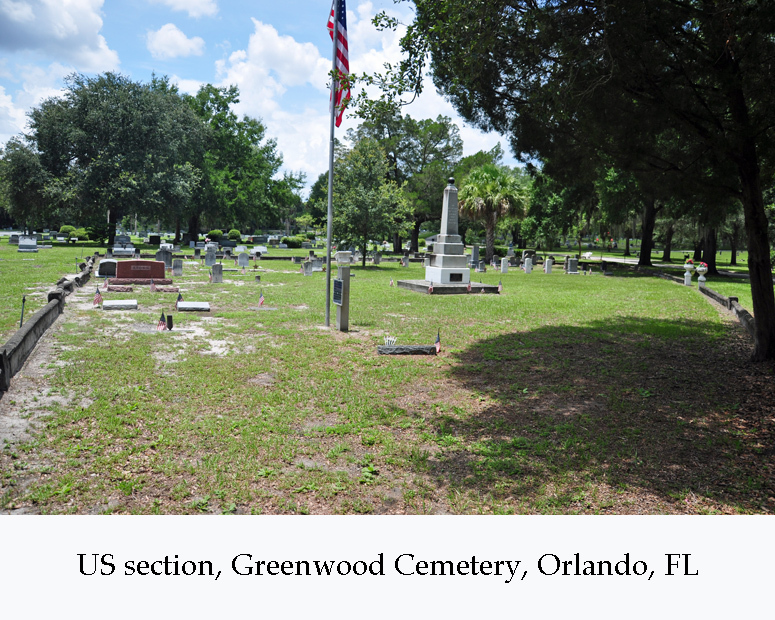 One of the days we were in Orlando, after visiting the Orange County History Center, we drove over to the Greenwood Cemetery. I’ve been in this cemetery at least once before. There are numerous veterans of the Blue and Gray interred there – you can see a list here – including a few Tar Heels who relocated after the War. What strikes me as interesting (ok, cemeteries are interesting), is that there are separate, post-war (in some cases, graves from the 20th century) plots for US Civil War soldiers, and CS WBTS soldiers. Yes, there are other veterans scattered across the older parts of the cemetery, and yes, there are non-Civil War soldiers buried in these sections, but I don’t think I have ever come across a cemetery with post-war sections designated for the two different groups. Have you? Chances are there are, and I’ve probably been there, but I surely cannot recall them. Both sections are surrounded by a small (6-inch ?) wall, with an opening for an entrance. The US section has a GAR monument. The CS does not have a monument, but there is a large CS monument a few blocks away (around Lake Eola). The Confederates are marked with iron crosses. All of the US graves had flags on them. The sections are only a baseball’s throw away from each other. So those are my adventures in the land of heart and humidity, and I look forward to your comments. RALEIGH – The Civil War savaged lives yet secured the future of generations in North Carolina and the rest of the nation, and altered the course of American history. The injustices suffered by African Americans were a major cause of the American Civil War (1861-1865). The fight for liberation is one aspect seen in the “Freedom, Sacrifice, Memory: Civil War Sesquicentennial Photography Exhibit” (www.nccivilwar150.com), which will visit the Forsyth County Public Library in Winston-Salem and the Robeson County Public Library in Lumberton from Aug. 1- 29. For info rmation on the Forsyth exhibit call the library (336) 703-3011. For info rmation on the Robeson exhibit call the library at (910) 738-4859. For tour info rmation contact the Department of Cultural Resources at (919) 807-7389. I’m off here shortly to the other side of our fair state. On Saturday (July 9), I’ll be signing books (and in the afternoon) speaking at Ft. Fisher State Historic Site. I’ll be around most of the day. On Sunday, July 10, I’ll be speaking and signing in Whiteville, NC, to the Columbus County Volunteers Camp, Sons of Confederate Veterans. They meet at 2:30 pm at the Peace Baptist Church on Love Mill Road. I’m sure they would like to have you attend. Of course, there will be lots of Civil War battleground tramping, and we’ll being eating some good seafood. If you get a chance, stop by and say hi! Folks – I found this earlier today and I thought you might enjoy. Five old Confederate veterans walked into a saloon in Raleigh the day the Davis funeral train was there to get some liquid refreshment. One of the five plunked down a silver dollar to pay for the drinks, but the saloon keeper informed him that the money was not good. The old Confederate looked at the saloon keeper and then his money, but could not understand why it would not go, as it had the right ring to it. The saloon keeper, to relieve the old veteran of his embarrassment, informed him that nothing but Confederate money passed in Raleigh that day. As you have probably noticed, I’ve been a little slack on the blog lately. There are a couple of reasons. I’ve needed a break after finishing North Carolina in the Civil War (History Press, 2011), and I’ve been traveling. As those you who have worked with the History Press know, their turn around is really quick. Since turning in the manuscript on May 2, I’ve been through two sets of proofs, worked on the back of book text, the front cover, and filled out the marketing material. Thus, I’ve never really had this project out-of-mind (or sight) for very long. The book is set to be released sometime around the first of September. So, I’ve got a few weeks to catch my breath… kind of…. Since it is coming out in about two months, I really need to be working on my marketing. Yes, the History Press does some, but as you know, no one can market a book as well as the author can. 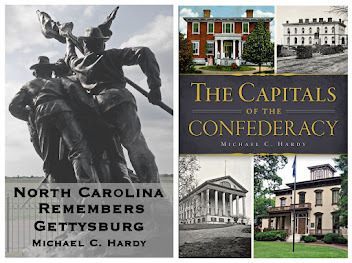 I’ve also been on the road speaking about the 58th north Carolina Troops, and about my latest release, North Carolina Remembers Gettysburg. I’ve been to Gettysburg, Atlanta, Raleigh (more than once), and a host of places in between. I do have a new project in the works, which I am not saying much about right now. I also have plenty of places still to go before the end of year, including a couple of signings in the greater Wilmington area next weekend. I promise I will get back to regular posting here soon. I’ve a host of things to talk about, just not much time to discuss them right now. By the way, what do you think of the new front cover of the book? DURHAM – Tar Heel soldiers in Civil War dress along with civilians in period garb will be portrayed by living historians at the July 9 program of 2nd Saturdays at Bennett Place State Historic Site in Durham . The free “Tar Heels and Textiles” program from 10 a.m. until 4 p.m. will demonstrate period techniques of weaving, sewing, carding of sheep’s wool, and related activities. 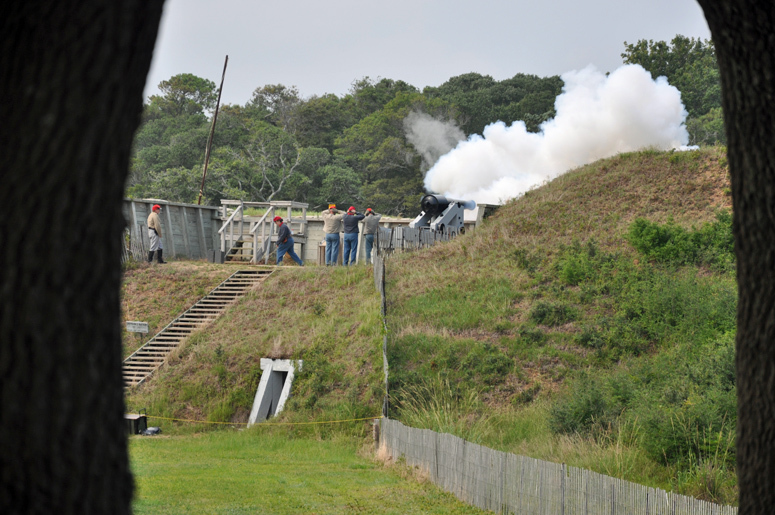 The N.C. Department of Cultural Resources is presenting the gas-tank-get-away 2nd Saturday events (http://www.ncdcr.gov/2ndsaturdays.asp) at its 37 state historic sites and museums statewide. The yard will be filled with exhibits and living history demonstrations about the 19th-century textile industry. Presentations will show how the North Carolina industry ramped up dramatically during the Civil War to meet demand and equip soldiers. Creative artists will show and sell related pieces of art. One of the speakers for the program will be from the Textile Heritage Museum in Glencoe (http://www.textileheritagemuseum.org/). In April 1865, the Bennett Farm was the site of the largest surrender of the American Civil War. Gen. Joseph E. Johnston and Maj. Gen. William T. Sherman met at the Bennett farmhouse to negotiate a solution to America ’s most tragic war. The surrender ended fighting in North and South Carolina , Georgia , and Florida , allowing 89,270 exhausted Confederates to return home. The mission of Bennett Place is to preserve and interpret the history of the largest surrender and the lives of yeomen farmers such as the Bennetts. Bennett Place is located in west Durham and can be reached from Raleigh by taking I-40 West to the Durham Freeway (Hwy. 147), exiting on to Hillsborough Road, then following the brown historic site signs, or from Greensboro by taking I-85 East and continuing to Exit 170 on to Hillsborough Road, then following the brown historic site signs. For further information contact Bennett Place at 919-383-4345, e-mail bennett@ncdcr.gov or go to the Web site at http://www.nchistoricsites.org/bennett/bennett.htm. Also follow N.C. State Historic Sites during the 150th Anniversary of the American Civil War at Web site http://www.nccivilwar150.com.